It’s been more than a year now since I arrived here in Nicaragua, the poorest country in Latin America and the second-poorest in the western hemisphere or the Americas after Haiti. It is also considered the safest country in Latin America since the Contra War ended in 1988. And so, despite the drastic change of my life from Los Ángeles where I worked for Catholic Charities – San Gabriel Region, I feel that I have been blessed in a different way for I am back to the simple life as I knew it as a missionary in southern Philippines where the people are deprived of the many comforts and abundance of things and yet, one feels the human warmth, the simple joys and contentment of living more interconnectedly with one another in the ordinariness of everyday. However, all that changed after April 18, 2018 when I woke up to a country in political turmoil. It is a nightmare I never imagined would happen in this already impoverished nation. The crisis started rather unexpectedly when pro-government gangs violently crushed a small demonstration against reforms to Nicaragua’s pension system announced on 18 April. Footage of the repression became viral on social media and has since then triggered more unrest and protests until today. I remember joining the peaceful demonstration the day after outside our parish church in Santiago Apóstol in Jinotepe. The voices of the young students chanting loudly against the abuses of the corrupt government under the conjugal dictatorship of Daniel Ortega and Rosario Murillo. They had every right to freedom of expression in public. However, there was pandemonium in the streets the moment they marched around the city when stones were literally hurled at them by pro-government groups, popularly known as “grupos de choque” (shock forces) who had in the past been used to repress anti-government protests and had discouraged many Nicaraguans disgruntled with President Ortega from taking to the streets. As a result, the young protesters took refuge inside the church as we closed the doors for safety and the wounded were immediately treated with whatever emergency aid we had on hand for it was quite risky to take them to the hospital for treatment. 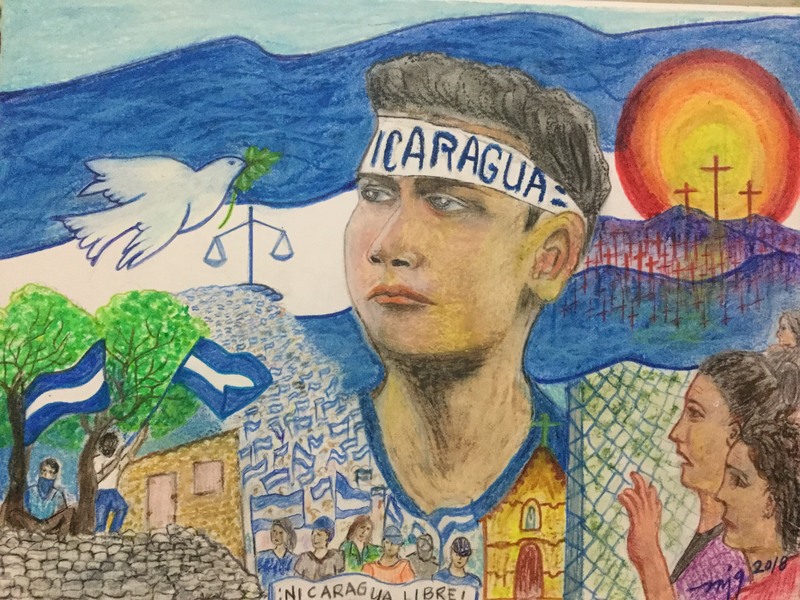 Since then, life in Nicaragua has changed drastically for the once sleepy and seemingly apathetic people especially the students have awoken from a bad dream and they have taken it upon themselves to do something to resist the forces of abuse and corruption in the hands of an inept government. The Catholic Church led by the bishops have been playing up until now a vital role in protecting the vulnerable citizens and more importantly have assumed the arduous task of mediating in the national dialogues between the government and civil society with business and private sector represented by their respective leaders. However, nothing concrete is happening in the national dialogue even if the world is watching and intervening in the process and so it’s unclear when the situation will change. To date, there have already been 351 deaths so far and counting, mostly university students including children but like the intermittent eruptions of a volcano, the people’s anger continues to find ways of civil resistance and increase pressure against the government through the barricades blocking major streets and highways, peace protests and marches, national strikes and the use of social media posting real footages of aggression and violence perpetrated by the police and paramilitary who roam around in hilux pickups causing terror and havoc in the lives of innocent civilians. Ironically, as the number of citizens and foreigners have already fled the country for safety and security for their lives and that of their families and everyday there is a long line of anxious people at the Immigration Office trying to get their passports, I am still waiting for my resident visa which is taking eternity to process. Meanwhile, I try to continue living life as normally as I can in community with two other sisters who are also foreigners, an El Salvadorean and a Spanish sister here in Jinotepe but we are all affected by the raging crisis that is fast bringing down the country into further brink of disaster with schools suspended for almost two months already, the increasing number of unemployed due to businesses closed temporarily or otherwise and the rising cost of living putting a strain and stress in the daily lives of the people. There are also sporadic firings in our vicinity that keeps us on alert at all times of possible danger lurking at the street corners. In fact, many of our pastoral activities with the children and youth have been suspended for purposes of security and most of our movements are narrowly confined in our center within the village. wounded by diehards of the Ortega regime who were protected by the paramilitary and police. Yet amidst all the chaos, they were able to free the people and managed to return to the capital in Managua without further harm. We are mourning for the Catholic Church that has been persecuted and suffered serious damages and loss of properties perpetrated by these godless forces who raided our parish church. All these because of protecting lives of the vulnerable and defenseless, healing the wounded and standing for truth, justice and freedom. And yet, it is so sad and frustrating to think that until now the government continue to refuse responsibility for so much bloodshed, instead they blame the situation on criminal groups and opposition political groups with specific political agendas. But like the volcano and lakes that Nicaragua is known for, the people’s unrest will also continue to unleash it’s lava now more than ever after their anger has erupted unexpectedly last April 18. I only hope and pray that the desired change will happen sooner before it’s too late for this embattled nation to recover and begin anew. At the moment, the crisis is serious for it has reached disproportionate heights of human rights violations in a short span of time. 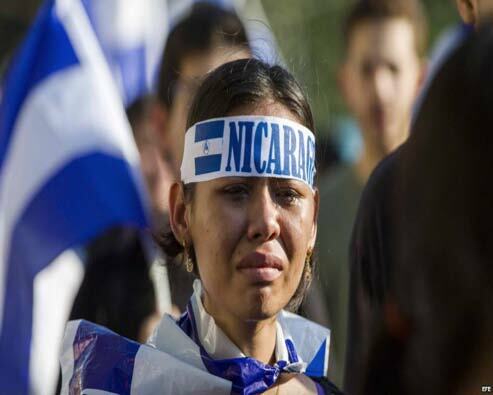 Human rights groups are indeed right in saying that Nicaragua has quickly and dangerously slipped back into some of the darkest times it has seen in decades. Marjorie Guingona, SAC – is a Filipina member of the Sisters of the Guardian Angels and author of the book, Colors of the Soul: Poetry and Paintings in the Spiritual Journey, which made it to the final of the Cardinal Sin Book Awards (Spirituality Category), published by Claretian Communications Foundation, Inc.